My primary geek fuel would have to be cola of some variety, historically I drank mostly Coke, but lately I’ve been trying to cut down on my can a day and instead I buy a 4-pack of Royal Crown Premium Draft cola once a week to enjoy over the weekend – it’s deliciously brilliant stuff (although a little pricey as it’s an AU import), very smooth to drink – doesn’t last nearly long enough! Other than sugary substances, I tend to start the day with a Soy Latte (would have more if it wasn’t for the cost/inability to make them at home) and have a growing coffee consumption going on, tends to be the less cola I drink, the more I go for coffee. 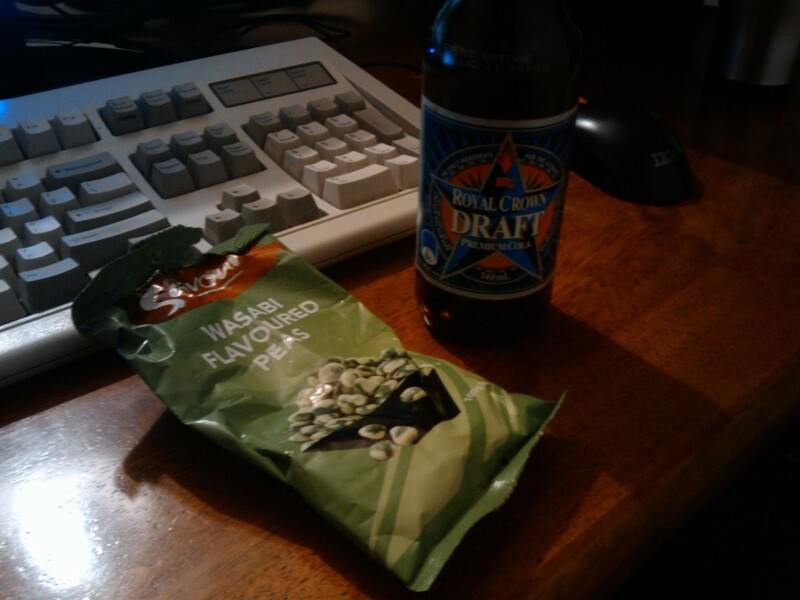 In terms of snacks, I’ve been cutting back on processed snacks such as M&Ms, chocolate and cornchips and been demolishing bags of flavoured peas lately – the wasabi peas pictured are so great, go well with almost any beverage (alcoholic or not). Then why the hell haven’t I heard about it? I live in Canada, we have a brand of Cola here called “R.C” (..which also stands for Royal Crown) but it’s cheap and kind of disgusting. AFAIK, it cost around ¢33.. they mostly stopped selling it here in favour of another product called Cott Cola, which.. while cheap; tastes awful.